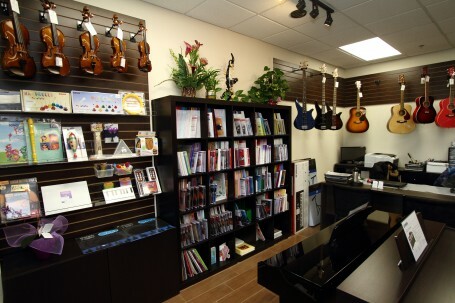 Pro-Music’s stores provide a variety of goods and services for all practitioners of music: musical instruments, books, audio systems, and accessories. Visit us in-store to view our collection. Our staff is more than happy to provide recommendations and accommodate your needs. All of our rental instruments have been carefully pre-serviced and are in perfect playing order before they are sent to you. Care of the rented instrument is the responsibility of the renter. Your signature on this contract makes you responsible for the return of the instrument in GOOD WORKING CONDITION, normal wear and tear are acceptable at the discretion of Pro-Music. The person renting further agrees that he/she shall bear full responsibility for any and all damage occasioned by the instrument during the rental period, reasonable wear and tear excepted, and shall pay all costs as specified by Pro-Music. Basic maintenance tasks such as lubrication and swabbing are the responsibility of the renter. Repairs to any damaged instruments must be completed through Pro-Music. During the period of rental, the rented items remain the property of Pro-Music. Pro-Music reserves the rights to terminate the rental contract at any time at the discretion of the Pro-Music service department. The person renting hereby agrees to notify Pro-Music within 7 days of any changes in the account status, including change of address, phone numbers and credit card information. All rentals are automatically renewed by default at the end of the contract to our MONTHLY rental plan, and the renter’s account will be charged. To terminate the rental agreement, all instruments must be returned directly to Pro-Music prior to the due date. Refund or Credit Transfer is not applicable in any types of rental programs. All credits must be used in its entirety on or before the end of the rental period towards the purchase of the same type of instrument being rented. A maximum of three months rental payment (before taxes) can be credited towards the purchase of the same type of instrument being rented. A maximum of 80% of the first year’s rental payment can be credited towards the purchase of the instrument. It is the customer’s responsibility to contact Pro-Music before the end of each semester or June 30th of each year to terminate or renew this rental contract. In the event that the rental instrument is damaged but repairable, the renter is responsible for a deductible fee of $50 CDN. Should the rental instrument be maliciously damaged, stolen, and damaged beyond repair, the renter is responsible for 25% of the full value of the instrument. This is at the discretion of the service department at Pro-Music. Should the instrument be claimed as stolen, a police report must be filed, the number of the report and office badge number must be provided to the service department at Pro-Music. Instrument accessories such as mouthpieces, ligatures, caps and neck straps are excluded from coverage.